On Saturday I walked around the Saratoga Springs farmer’s market in awe. I haven’t been to a good farmer’s market all summer, and I had forgotten how many farms we have around here. I bought a load of stuff, but one of the things I was most excited about was the patty pan squash. They’re definitely one of the cutest vegetables around. And I wanted to stuff them with something. I looked around at stuffed pepper recipes to see if anything looked like it might go well in squash, but I didn’t want to put a grain of any kind in them. I was thinking white beans. I think I saw a recipe for a baked white bean spread that sounded really tasty, and I decided on mashed white beans. Slice the tops off of the squash and place them in a pot. Add enough water to cover them about halfway and bring it to a boil. Let it simmer for ten minutes or so, just until the squash is soft. Take them out of the pot and let them cool a bit. Oh yeah at this point you might want to preheat your oven to 375F. 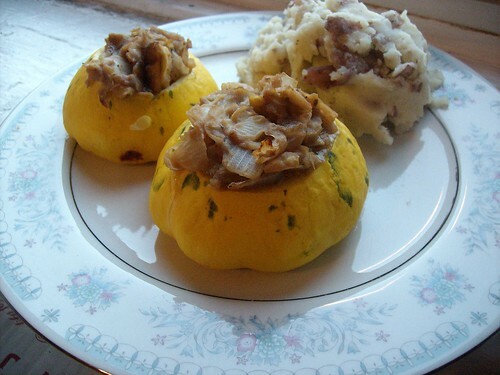 Once the squash are cool enough to handle, scoop the flesh out so you’ve got an empty squash shell. Be careful! Chop the flesh up and saute it with the onion in a little olive oil or cooking spray. Then add the beans and seasonings and cook until it’s all warmed through. At this point, I took out my potato masher and started going at the beans. I probably should have pre-mashed the beans because onions and squash bits just don’t like to mash like beans do. So it was pretty chunky, but fine. Add some balsamic vinegar and mix it all up. Spoon that mixture back into the squash shells, put them in a baking pan, and cook for twenty minutes or so or until they’re a bit brown on top. Admire how pretty they are! And eat! I love soup. I love making big batches of soup and eating it all week for lunch. And I’ve been doing that! On Sunday I made up a big pot of lentil soup. It was one of those things where I just dumped everything in my soup pot and let it cook. It doesn’t look very impressive, but it’s really, really tasty. I threw it in my blender to get it all smooth, but I suppose if you want it chunky you could chop up the apricots and any veggies you want in there. I think I’d suggest using a lentil that doesn’t quite fall apart as much when it’s cooked if you’re not going to blend it, though. Red lentils get really mushy. potatoes! probably a little over a pound. leave the skin on, it’s good for you! Throw everything in a pot and give it a stir. Cover it and bring it to a boil. Turn down the heat and let it simmer for a half hour or so. Then whiz it around in your blender, taste and add any other spices that you want. I think I just threw in some black pepper. So easy! I like the mixture of cumin and the apricots a whole bunch. 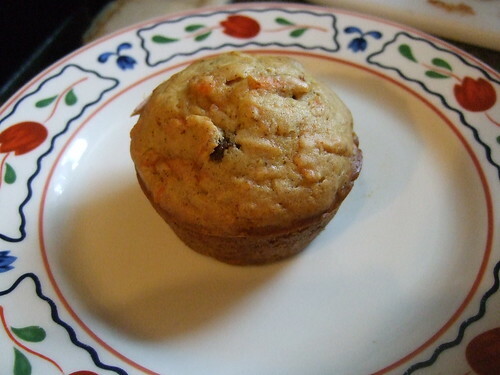 So, you know we love Vegan with a Vengeance and I look for every opportunity to make a recipe out of it, so recently I decided to make their Carrot Raisin Muffins. When you grate carrots fresh, they’re surprisingly sweet. It was a simple recipe that I made while I was watching the third season of Avatar and the results were tasty. I ate on them all week. And Ellen’s moving here soon so next time I make muffins she’ll be able to have some! 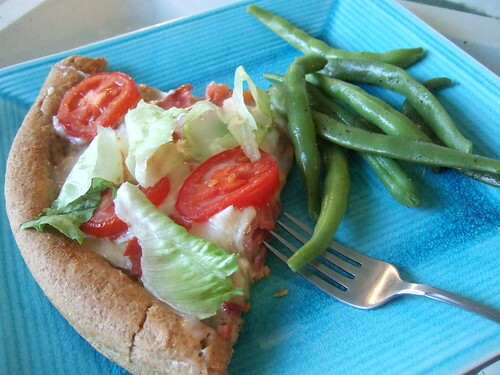 1 whole wheat crust. The smaller kind, maybe 12 inches? So, coat the pizza with a thin layer of vegenaise. Chop you mozzarella substitute into chunks and sprinkle that around. Now add your bacon and tomato. Don’t add your lettuce! It’ll get gross in the oven! Cook it in your oven at 450 degrees until the vegan mozzarella is melted and the bacon is crisp. Maybe 20 minutes or so. Once it’s done, take it out, scatter the lettuce on top, and then slice it up. Like I said before, this might be a little to substitute/fat-heavy, but it’s really pretty good. Let me know if you try it out. It’s the middle of August, and it’s starting to feel like the end of September. Mix that with daily rains/thunderstorms/generally miserable weather and you’ve got a perfect time for soup. You’ve also got global warming, but that’s just a myth, right? Riiiight. I had the best corn chowder ever in Quincy Market, but I don’t even want to know how much cream went into it. But it was so great. I haven’t made a creamy soup since giving up dairy products, so I’ve been a little suspicious of how it might come out. 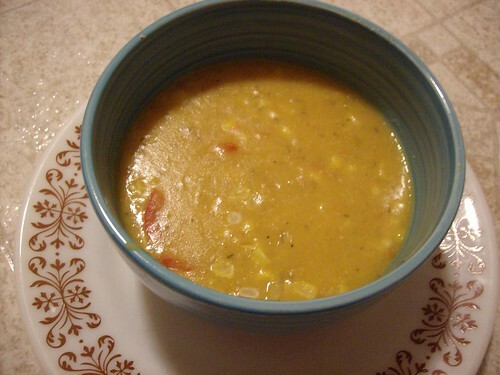 But Bret and I were looking through his copy of Vegan with a Vengeance and saw a recipe for corn chowder. So I had to make it. Holy cow, what an awesome soup. It calls for a mix of spices that I wasn’t sure would go well together, but they did. 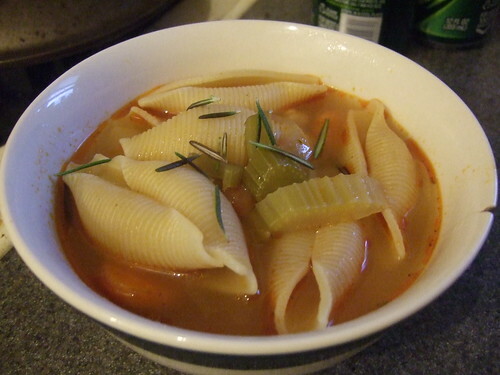 It’s a spicy soup, if you don’t like spicy so much you might want to go with one jalapeno instead of two. I might have been a little heavy on the cayenne, too. But it’s just another reason to get this cookbook and hug it and sleep with it and make the recipes in it. So Jennifer told me about this recipe, and I decided I would make it. The batch it made was huuuge and I ate off it for a week, and I even gave a bunch to my roommates. The recipe is, like, stolen and scanned from somewhere else but I won’t tell anybody if you don’t. Shhh. Heat your oil and then cook your veggies for 5-7 minutes. Then, add your chickpeas and cannellini and cook for 5 minutes. Then stir in the water and tomatoes and cook for 2-3 minutes. These directions seem way too specific but I guess that’s how you do it if you’re writing recipes for a magazine. Okay, so then add your stock, rosemary, salt, and pepper, and bring the whole kettle to a boil. Lower the heat to simmering and cover the pot and let it cook for, like, an hour. I went and watched a couple episodes of Avatar while this was going on. So after the hour’s up, add the pasta and bring it back to a boil. Lower heat again and simmer for however long it takes to make the shells soft. Then you’re done! So I heard some good things about this Antipasto’s place from Ellen and now I see why. It’s pretty rare to find an honest to goodness vegetarian restaurant outside of NYC. Ithaca has two so seeing what Albany had to offer was sweet, and man – Italian. They have vegan raviolis and a totally sweet wine list and pizza. I wanted pizza. So we got pizza. 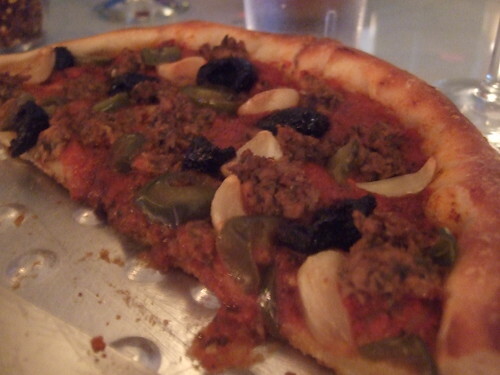 After a whole lot of agonizing over toppings we went with veggie sausage, whole garlic cloves, oil-cured olives, and… I can’t remember. Mushrooms? Not the best picture but it was dark. My only complaint, and this is not even a big deal, is that their soy cheese contains casein. Oh well. They have plenty of other things I can eat on their pizza, and man was it good pizza. It was super nice of Bret to take me out for a birthday dinner after he had already made me a birthday pie. But I mean, we had to do something while the pie cooled down. Brian was our waiter again and that guy is just so happy. He was patient while we mulled over topping choices (the fourth one was hot peppers!). It was a bit of a bummer that their soy cheese isn’t vegan, but I really like pizza without any sort of cheese substance so it was a-okay. Antipasto’s makes me want to learn how to make a really good pizza dough because theirs is so good. Antipasto’s and Bret make for total awesomeness. Yay! Lasagna is totally one of my favorite things to make. There’s no need for a recipe, and I never make it the same way twice. I’ve made plenty of vegetarian lasagnas, but they always had mass amounts of cheese to make up for the lack of meat. 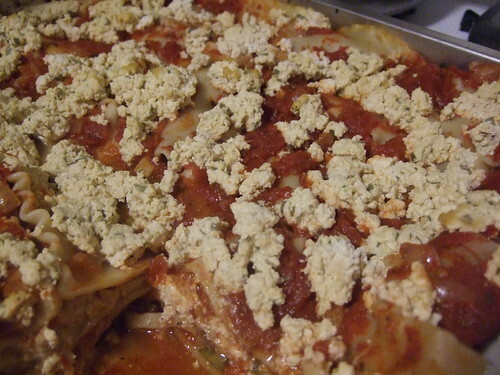 So, I wanted to try making a vegan lasagna. And I did! And it was tasty! I’m not going to write out a recipe for this, because lasagna should be whatever you want, but there are a few key things that made this really really good. 1) Sauce. I made my own, with onions and lots of garlic and a healthy amount of crushed red pepper flakes. 2) Tofu ricotta. I’ve made tofu ricotta before, and it had pine nuts and various other things in it. This time I went for a simpler version, taken directly from The PPK. I needed two batches of it for the lasagna I made, which was three layers in a large roasting pan. 3) Fillings! I figured I needed something extra in there, and I went for veggies. I sauted sliced portobello mushroom and some zucchini and deglazed the pan with balsamic vinegar. That was added between they layers and added some bulk to it. I’m also thinking of maybe crumbled tempeh sausage in the future. Bret took a nice picture of my lasagna. I had covered in it foil and cooked it at 350F for about 45 minutes. That seemed to do the trick without drying things out and making sure everything was warmed through. Nothing cheesy to melt here, but some Veganrella on top might be nice! It’s been a while since I’ve posted a pasta recipe, so here we go! This one is being submitted to Presto Pasta Nights, run by Ruth at Once Upon a Feast! Stir fry is kind of a staple around these parts. Sometimes it might be all I make for dinner in a week. Fast! Simple! Tasty! Inexpensive! Here’s how I do it. Put all the oil in your wok or whatever you’re using and heat it up hot hot hot. I put it on high heat. Drop the tofu in there. Careful, this will probably splatter. 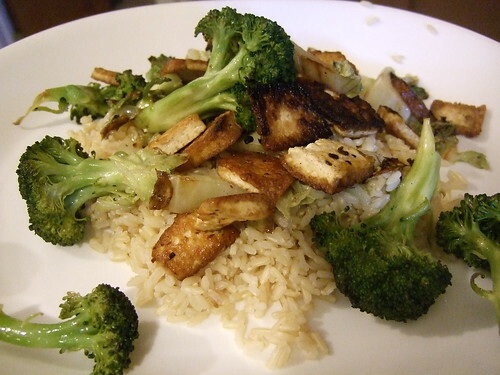 Cook your tofu until it’s nice and brown and has a chewy texture. Don’t let it burn! Turn the heat down. to about medium. Add in your broccoli and your cabbage. The broccoli should turn bright green and the cabbage should get soft. Maybe even a little slimy. Have about a cup of leftover rice in your fridge? Throw that in there too. Add soy sauce to taste while the wok is still hot. If you just cooked some fresh rice, no big deal. Just serve the stir fry over top of it. Each time I make this, I make two cups of rice and store the other cup in the fridge. Then the next day the leftovers go into whatever I’m making. This makes about enough for one person. Easy enough to double up or whatever. Inspiration for this came from my friend Ben’s fried rice recipe. 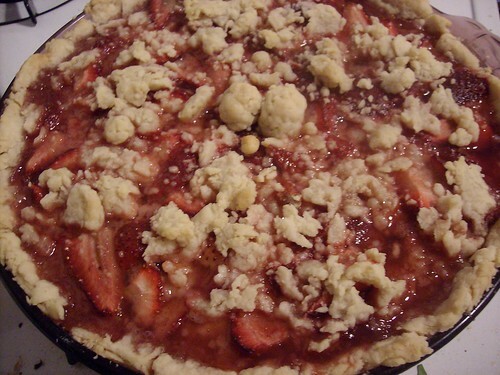 A Vegan Strawberry Birthday Pie for Ellen! Ellen had a birthday! Happy birthday Ellen! I’m glad you were a fetus! She asked for strawberry rhubarb pie which didn’t work out because I apparently missed rhubarb season (and my chance to make rhubarb crumble – argh!) but there’s still strawberries all over the place so there was a quick change in plans. 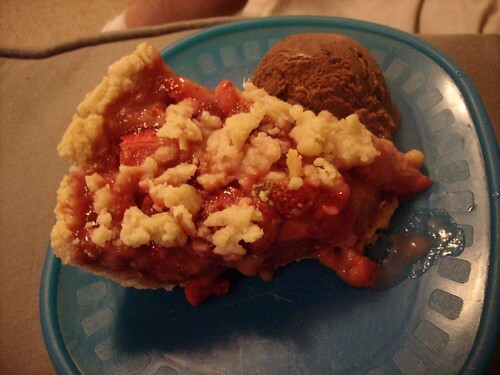 I made strawberry pie! For pie crust I used the recipe over at Almost Vegan. It was really flaky and good. When making pies in the future I’m going to recycle this recipe. However! I am no good at making pie with, like, a lid, so I ended up just taking what I had left and crumbling it over the top. That worked out fine. If I wanted to get fancy I could have made a lattice I guess, but know who makes lattices? Show-offs. The filling is a modification of this recipe which you’ll see if you follow the link isn’t actually vegan if you’re a non-honey eating vegan. I’ve known some people who call themselves vegan and eat honey and that’s okay by me. But that’s not what we were doing and also we didn’t have rhubarb so this is what I did. 6 cups strawberries – you can slice them thin or thick or whatever. I just quartered them and that worked out great. So put all your strawberries into a colander and rinse them off. Once that’s done, put the colander over a big bowl. Pour the maple syrup over top of it and let it run into the bowl. Let it drain for a few minutes. If you’re using pure maple syrup that won’t take very long. 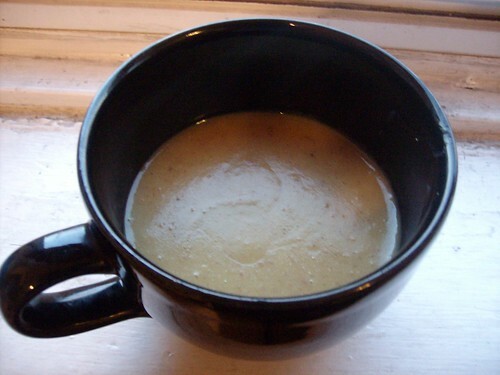 Take about half of that maple syrup and put it in a saucepan with the arrowroot. Heat it up on medium heat until it gets bubbly. Stir it up good and regular. It probably won’t thicken. That’s okay. It’ll do that later. Preheat your oven to about 350 at this point. Mix your syrup and your strawberries together with the cinnamon and flour and toss it around with a spoon until its all even. Then pour it into the crust. Put on your lid or lattice or crumbles or whatever the Hell you decide to do. Bake it for an hour. Pull it out, let it cool, then stick it in the fridge for a few hours to set. At this point it should be perfect. Then eat it with a cute girl (or boy I guess) and a scoop of soy ice cream and watch a really bad Troma movie. The end!